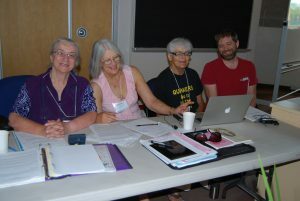 Elaine Bishop was released from her role as Clerk of Canadian Yearly Meeting at the rise of CYM-in-Session this August. Elaine has served as Clerk for the past four years, graciously extending an initial three-year term to “finish some of the good things started, and also because no-one came forward to serve,” as she put it. A member of Winnipeg Monthly Meeting, Elaine had previously served as Clerk of CYM in the 1980s. Elaine’s birthday also happened to fall during CYM (August 12! ), which was a great excuse to have cake. Where do I start? 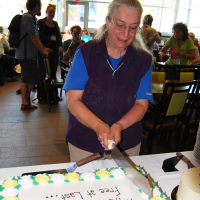 To recognize Elaine and her amazing contribution to CYM would require an entire SIG time slot – and since that’s no longer possible, I’ll only share a few words. I would be remiss in not mentioning her tremendous, heartfelt work with CYM which is far-reaching and for which the benefits will last for many years to come. Her professional life with CYM is obvious – well done, Elaine and thank you; you deserve every accolade! I began working with Elaine on Program Committee – and more closely when she was Clerk of the Committee. I admired her style, I admired her attitude, I admired her ability to guide a meeting by being both gentle and firm. I immediately respected her. Elaine transitioned from Clerk of Program Committee to Clerk of the World (as Gordon McClure once joked when he was CYM Clerk some years ago! That always made me chuckle.) I watched as Elaine guided CYM through some difficult transitions with grace. Elaine has been there for me both personally and professionally – when I wasn’t quite sure how to handle something, I instinctively knew who I could turn to. Elaine, you leave a legacy and very big shoes to fill. CYM is fortunate to have you in the Quaker family and I am blessed and honoured to know you and have you in my life. I think I speak for all of us when I say you’ve more than earned putting your feet up and enjoying a hot cup of tea. Elaine is one of the clearest thinkers I know. She has an extraordinary ability to simultaneously hold a vision of the big picture and the details that must be in place to achieve it. Yesterday in Quaker Study, Manuela talked about gratitude as part of the inner journey of reconciliation. Tomorrow we release Elaine from her service as Clerk of CYM, which followed a number of years of service as Clerk of Program Committee and previous service leading other CYM committees, including CFSC. I hope we can allow Elaine space to explore a new rhythm to her life, and I hope Elaine can protect her own time to “love this land as Indigenous Peoples do.” I am confident Elaine will continue to be with us in new and exciting ways. Thank you, Elaine, for sharing yourself so generously. Barbara Horvath, 10 August 2018.